As social networks go, LinkedIn is all business, and your marketing strategy around this platform for professionals should be made to match. That’s why having a guide to LinkedIn tailored for marketers is essential if you’re going to take advantage of every aspect of the platform for your company. 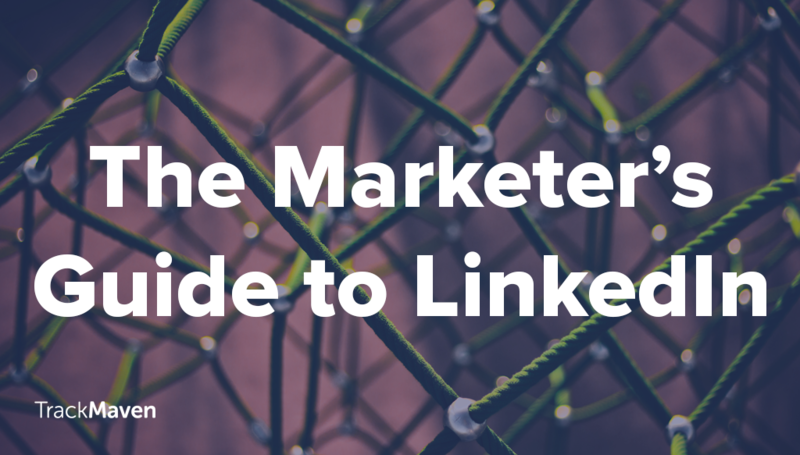 In this marketer’s guide to LinkedIn, we cover every part of the platform your business should be using. We’ve included best practices for brands, tips to increase your LinkedIn footprint, and an outline of all the features and analytics you should be paying attention to as a marketer. Here’s the lineup — click on the section you want to jump to! Why is marketing on LinkedIn important? How do I use LinkedIn for my brand? How do I create an effective LinkedIn company update? What are LinkedIn groups and how do I manage one? What do I need to know about advertising on LinkedIn? How do I use LinkedIn analytics for my brand? LinkedIn is a go-to resource for online professional networking, job hunting, and industry news. There are more than 400 million professionals on LinkedIn, including 6.8 million C-level executives. If your business has a presence on LinkedIn, it has access to a huge pool of professionally minded individuals. There are a few different components of LinkedIn that work particularly well for brands. Let’s walk through each component, going over how to use them and best practices. Despite the advantages a business presence on LinkedIn has to offer, only 57 percent of businesses have a company page on LinkedIn. What we want to concentrate on is how to take your LinkedIn page to the next level. 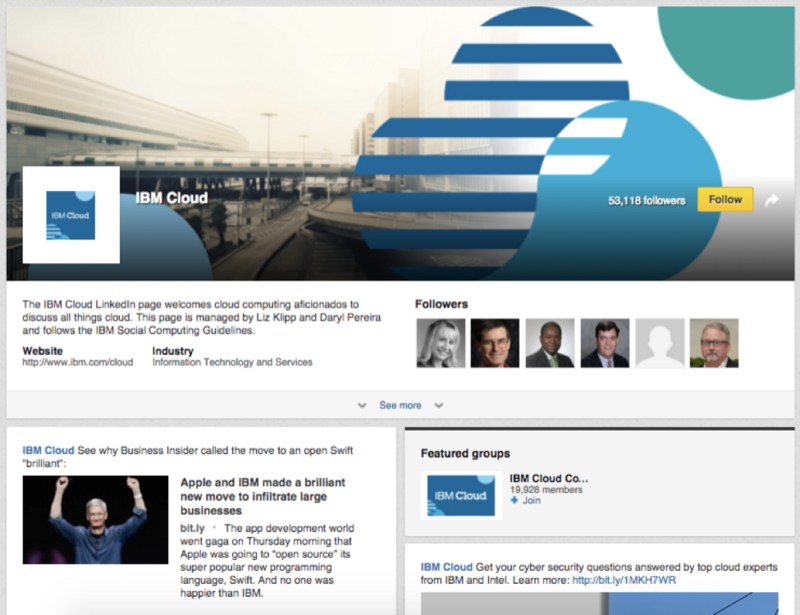 Here are best practices for improving your LinkedIn company page. Optimize for search. When creating your company’s page, LinkedIn will ask you to provide information about your business. This information appears at the top of your profile. It is vital to introduce visitors to your business and its mission. However, the language you use is also crucial for driving traffic to your page; LinkedIn company pages are incredibly SEO-friendly. Search engines and LinkedIn’s internal search crawl words and terms on businesses pages to rank their results. Note that Google only previews up to 156 characters of your page’s text. Make sure your company description is especially keyword-rich and starts off strong so that potential visitors want to learn more by visiting your page. Remember that the keywords you use on LinkedIn should align with the keyword strategy you use on your own website. This signals to Google that you’re consistent in your value proposition. Add eye-catching banners. There are 4 million business pages on LinkedIn. Help yours stand out with attractive banner images that provide a look at your products, values, or culture. Read our blog post about social media image sizes for banner specs. Download our free Social Media Image Templates to easily create banner images for LinkedIn company pages! Create a careers section that shows off your company culture. 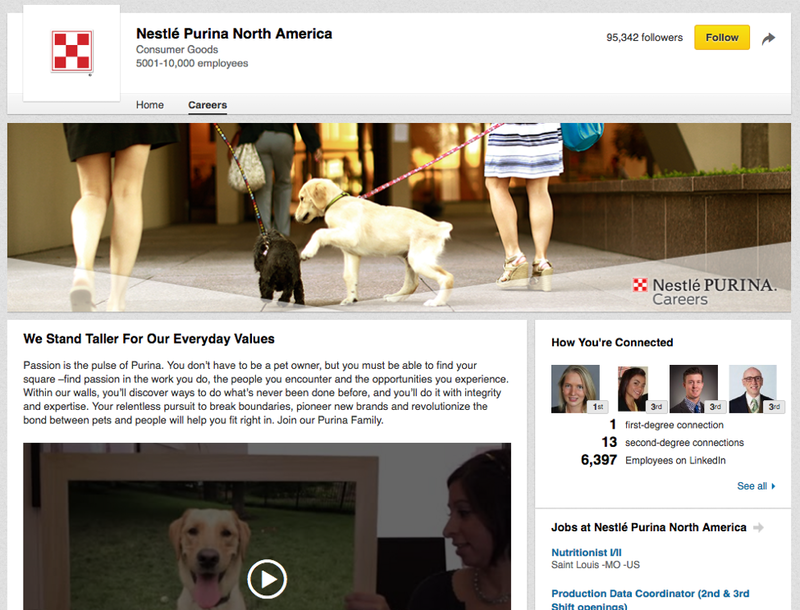 Showcasing your company culture is a great way to define your unique brand on LinkedIn. Create a careers tab to give visitors insight into your company’s work philosophy and mission.In the careers tab of your company page, describe what it’s like to work there. You can highlight current employees, add a unique banner image, post job openings, and more. Having a careers section for your LinkedIn company page can improve your recruitment efforts and introduce your audience to the DNA of your business — its employees! Work with your human resources and recruiting team to ensure that this section is as robust as the rest of your company page. For access to more advanced options in the careers tab, such as creating multiple versions of the page that target different audiences, you can upgrade to Silver and Gold career pages. If you have a product line or brand that you want to promote, you can create a LinkedIn showcase page. A showcase page is a sub-page of your company profile. It has its own banner, followers, analytics, and targeted audience segments. Creating a showcase page allows you to focus promotion around one product or brand, rather than your company as a whole. Be selective in choosing what to highlight, as LinkedIn only lets you have up to 10 showcase pages. Optimize the title and URL for search. Use your target SEO keywords when selecting a name for your showcase page. You can also claim a unique showcase page URL, which should also include similar keywords. Optimize the page content for search. Write a compelling product description that is under 200 characters, and include relevant keywords. Add a link back to a page on your business’s website that is about the specific product or service being showcased. Use appealing imagery and banner graphics. Make sure to add a logo and banner image for your showcase page that will attract audiences and motivate them to engage. Post regular updates. Post showcase page updates that follow the best practices outlined in company updates — just make sure they center around the product or service being highlighted. Remember to keep them keyword rich. Companies cannot currently publish long-form content directly on LinkedIn. You or other employees of your company will have to publish long-form content on behalf of your organization from personal accounts. LinkedIn Pulse is an app that surfaces long-form content and serves as a (self-described) newspaper of digital content. The optimal size for the featured image in a long-form post is 700 x 400 pixels, and posts have an unlimited length. Use blogging best practices when writing, including keyword-rich text and headers. Keep your writing focused. Avoid covering too many topics in the same long-form post. Use the share box on your homepage to share short-form thoughts, questions, and other media such as articles and images. On average, almost 4 million people visit SlideShare every day on desktop alone. That’s a lot of business-focused users you can reach using content you’ve probably already created for presentations and webinars, or content that you could easily create by repurposing published pieces. SlideShare also has the ability to capture leads on paid accounts. Between 10 to 30 slides is optimal. Ensure that each slide smoothly transitions to the next in terms of content as well as design. Show an average of 19 images (per set of 10 to 30 slides). Aim for an average of 24 words per slide. Focus on improving SEO for each presentation. Include keyword-rich titles, descriptions, and tags to give your presentations to bump up its ranking on search engines and to improve its standing inside the SlideShare search results. Integrate your presentations into multiple channels. SlideShare can be embedded into web pages and renders on Twitter. Company updates can be up to 600 characters long, and link titles and descriptions can be up to 250 characters each. You can include text, links, and rich media files. 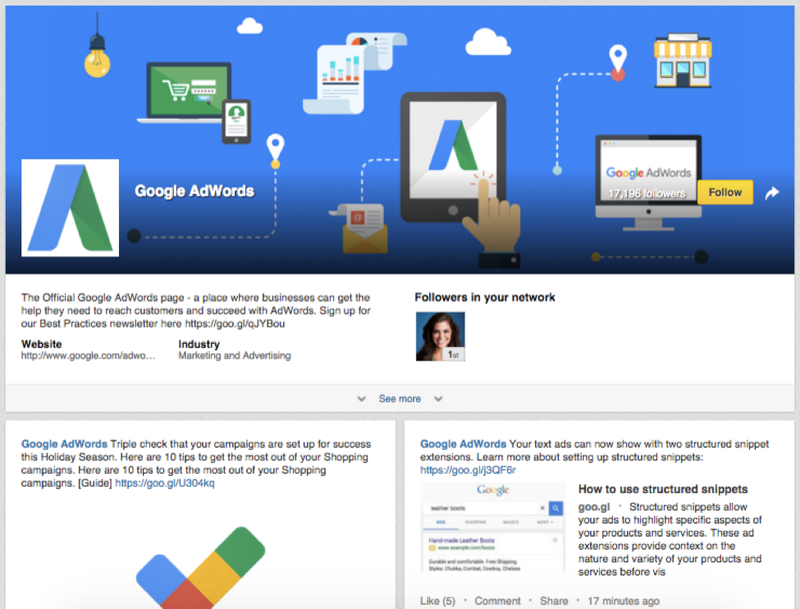 Updates appear on your company page and on your followers’ feeds. As with any content channel, the key to improving your LinkedIn strategy is to experiment and test, plan your content calendar, and analyze and revise. Download our free Content Calendar Template to help plan your editorial schedule! Before posting updates, make sure you’re assigned as an administrator for your company page. Use appealing imagery. Attractive photos and design can attract the attention of new audiences and inspire users to share your updates. Make sure the meta-images for your brand’s webpages are up to date. You can attached rich media files, including photo files, SlideShare presentations, and Vimeo and YouTube videos. Check to make sure all files are the right dimensions and file size. Want to create amazing images for social media? Download our free Social Media Image Templates! Include links. Drive users engaging with your content on LinkedIn to visit your website. Create “snackable” content. Keep your updates simple, easy to comprehend, and snappy. Highlight company milestones and accomplishments. LinkedIn is a great place to build your brand’s professional reputation. Pretty much anything you’re putting in a press release should also be posted in a LinkedIn update. According to LinkedIn, 53 percent of users are interested in company news and 43 percent are interested in new products and services. Provide tips and industry best practices. Focus on “always be helping” instead of “always be selling.” Keep in mind that LinkedIn audiences are generally more accepting of technical or industry-specific content that might not do as well on on Twitter or Facebook. Avoid posting multiple updates about the same thing in a short period of time. LinkedIn users do not react well to repeat content. The half-life of a post on LinkedIn is much longer than Twitter, or even Facebook. Include information about hiring, job listings, and company culture. Give LinkedIn users what they came to the platform for — direct information on available jobs. Share relevant industry news and insights. This will make your company updates more interesting and build engagement and relationships with other brands and influencers. In fact, according to LinkedIn, 60 percent of members are interested in industry insights. Focus on brand awareness first. Provide content that LinkedIn audiences would appreciate to pave the road for lead generation, community buildings, and lead generation down the line. 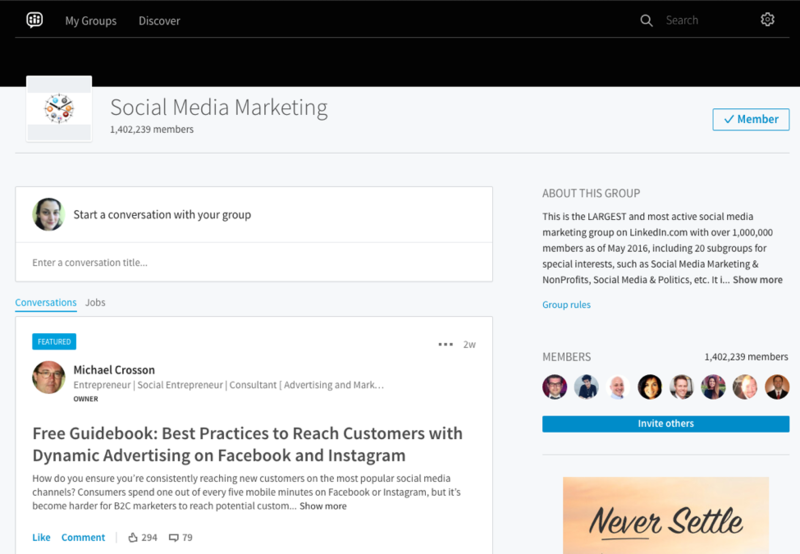 LinkedIn groups are a great way to create a forum where members can share questions, ideas, and insights on specific topics. Think of your brand as providing the space where this conversation takes place, and you are the manager. You invigorate discussion, answer questions, manage membership, and keep the comments clean and tidy. Brands cannot currently create groups, so you or another employee at your company will have to. Focus your group around a topic area, rather than just your brand’s name. Use keyword-rich language in the name, summary and description. Also be sure to include specific guidelines for appropriate content that can be posted in the group. Make your group’s listing public (“standard group”), so anyone can request to join. Share timely and relevant content; for example, breaking news and exclusive product information. Ask your members for feedback on how you can you make this group better. Check at least once or twice a week for requests to join, submissions to approve, and flagged posts to moderate. If possible, check daily to encourage group growth. Keep your group spam-free by reporting spam and reviewing flagged content in your moderation queue. Spam is the top reason people leave groups. Use Manager’s Choice to highlight important conversations and information. Encourage engagement with high-quality conversations by closing announcements, answered questions, and other content that no longer need comments or likes. Celebrate milestones. For example, you could send an announcement when your group reaches a certain number of members. If you need help, you can add managers and assign moderators. What should I know about LinkedIn ads? Once you’ve identified a valuable audience on LinkedIn, you may consider investing some money in promoting the company page and key updates, as well as ads around the platform. B2B marketers can get a lot out of LinkedIn ads in particular, as they look to sell to other companies on the platform. For details on ad specs, check out LinkedIn’s website. Sponsored Content with images and video tend to perform better. Have a targeted audience of at least 300,000. Keep the headline under 60 characters. Start with a question or quote to hook the reader and use “You” to speak to your audience. Businesses that post updates excessively are subject to review by LinkedIn and could risk having their page deleted. Marketers can use LinkedIn’s sponsored InMail to send personalized messages to an audience with a defined set of parameters (according to LinkedIn’s audience targeting options). Some marketers have employed InMail for lead generation, outreach, and recruiting efforts. According to LinkedIn, with Sponsored InMail the best practice is to keep your targeted audience within the range of 100,000. Check out more InMail best practices. Display and text ads on LinkedIn have similar targeting options to other content on LinkedIn. Where do ads appear? They can appear on the side or at the bottom of a page, as well as on a user’s inbox. Self-service display ads allow you to include an image or video, in addition to ad copy. Create focused targeting criteria. For Text Ads the majority of advertisers are successful when they target between 60,000 to 400,000. Set an aggressive maximum bid. Give your campaigns a higher chance of success by ensuring that you have a competitive bid. Always include an image. Clear, bright images of business professionals make your ads more personal and appealing to potential clients. Use a strong call-to-action. Ads with a strong call to action, such as “Register Now!” or “Sign-up Today!” perform better. Create multiple ad variations for each campaign. Use two to three active ad variations per campaign to show variety to your audience while also allowing you to see which strategy is most successful (A/B testing). Address your audience directly. Grab their attention by calling out to your audience in the headline (e.g., “Attn: High-Tech Managers” or “Are You an IT Director?”). Keep your ads and targeting relevant. Our system serves relevant ads more often and limits ads that rarely get clicks. Turn off low-performing ads. Active ads with a low CTR can weigh down a campaign and lead to a drop in impressions. Minor changes can have a big impact. Even simple changes, such as adjusting targeting, raising bids, and refreshing/creating ad variations, can increase your performance. How do I use LinkedIn Analytics? LinkedIn’s native analytics has a good amount of information on audience and engagement with your company and showcase pages. Note that Showcase Page analytics are not combined with the analytics of the Company Page, but you can access them separately from your Showcase page. You can also look at analytics for your personal publishing on LinkedIn. The Company Updates section has three areas: updates, reach, and engagement. Preview – Shows the first few words of your post if it included text. If only an image was posted, administrator will see the image’s alt text or file type. Date – The date each update was posted. Audience – Indicates whether the update was sent to all followers or targeted. Sponsored – Shows which campaign(s) you’ve sponsored content in, if any. Learn about sponsoring content. Impressions – The number of times each update was shown to LinkedIn members. Clicks – The number of clicks on your content, company name, or logo. This doesn’t include interactions (shares, likes, and comments). Interactions – The number of times people have liked, commented on, and shared each update. Followers acquired – How many followers you gained by promoting each update. Engagement – This percentage shows the number of interactions plus the number of clicks and followers acquired, divided by the number of impressions. Reach: A graph showing the trend on the number of times your updates were seen both organically and through paid campaigns on a daily basis. Use the dropdown on the left side of the page to change the date range. Engagement: A graph displaying the number of times members clicked, liked, commented on, and shared your content in both organic and sponsored campaigns. You can adjust the date range with the drop down on the left. 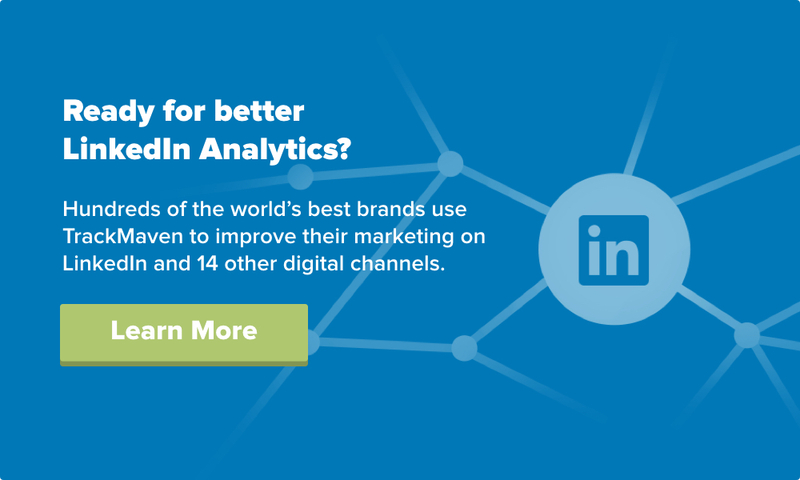 Learn more about how to use LinkedIn analytics for your business. Want to find out how TrackMaven can help your company on LinkedIn? Request a demo now!